It is that time of the year again, in which various “year-in-review” posts start appearing. My intention was to follow what I did in 2013 and 2014, and present my list of 2015 photographic highlights. However, for me 2015 lagged a little photography-wise, and judging by the scarcity of similar annual summary posts from fellow photographers it sure feels like I am not the only one in this. What I can say though, is that I spent a lot of time testing different combinations of my equipment. After publishing my series of wide-angle macro posts I saw them as finished and had no plans to continue. But a recent development convinced me otherwise and I am proud to present part 4 in the series, alternatively titled – You should never stop experimenting with gear. A curious praying mantis (Mantis religiosa) checking me and my “awkward device” out. In the previous post I mentioned that one can achieve a satisfying wide-angle macro effect using a relay lens system. It is probably the cheapest way to go about it too, as the different parts can be obtained in garage sales and thrift stores. However, using a relay lens has its own drawbacks, for example stepping into full manual gear territory, extreme chromatic aberration and soft focus. This is not, by all means, the end of the world, and after a period of trial and error using my relay system I managed to get some interesting results with a very unique perspective. I was happy with those photographs, for a while. My previous relay lens system. It used two full sets of extension tubes, a reversed wide prime, a few more tubes and adapters and finally a tiny CCTV lens. No wonder light barely reached the camera’s sensor. But after some time I grew tired of the cumbersome system I built. Each photo took me over 10 minutes to plan and execute, rendering most animal subjects uncooperative. I was frustrated with the lack of auto aperture control. And most annoying – my relay lens system was very long, with a tiny front element. This means that it did not let too much light enter the camera, resulting in a dark, upside down image in the viewfinder. In addition, the photos I got using this system all had soft focus and a strange halo around the subject, and I suspect this was a result of chromatic aberration, diffraction and the way I was lighting the scene. It was back to the drawing board for me. I started to think what kind of look I wanted for these wide-angle macro shots, and then I remembered that some years ago people experimented with attaching a peephole lens to a point and shoot camera to get a fisheye effect. Incidentally, some of these combinations had wide-angle macro capabilities. Once I had an idea of what I wanted, I verified that it was indeed plausible, and went hunting for the suitable parts. The problem with peephole lenses is that they vary in image quality, and also some lens combinations “play well” together while others result in a photographic catastrophe. It took me over a year to come up with the right combination of optics to get the desired look I was after, but I think I got it now (at least until I find something that works better). Male carpenter bee (Xylocopa virginica) feeding from goldenrod flowers. Such big eyes you have. This current relay system is shorter, lighter and has auto focus and aperture control. The results are much sharper and there is no loss of detail. Almost perfect. Wait, almost?? Yes, although this lens combination perform better than others, the final result also depends on the camera settings, subject magnification and lighting conditions. One thing that is hard to avoid when using this system is sunstars. With a front element allowing a 180° field of view, the sun almost always ends up in the frame. Some people love sunstars, but I must admit that this effect gets old quickly when you see it in each and every photo. Aster flower (Symphyotrichum sp.) with a complimentary sunstar. Bumblebee (Bombus sp.) pollinating a waterfall of white aster flowers. And a complimentary sunstar. What I really like about this system is that it is perfect for photographing pollinators. The front element is still quite small, and perceived as non-threatening by skittish insects. A pair of European paper wasps (Polistes dominula) standing their ground on goldenrod inflorescence. Flies are exceptionally skittish when it comes to wide-angle macro. I was lucky to get a few nice shots of this fly pollinating before it took off and vanished. Honey bee (Apis mellifera) pollinating. This is one of the shots I had in mind way before I even started assembly of the lens system. I will probably repeat it a few more times – a sunstar managed to sneak into the frame! Another aspect of this system is that it allows to experiment with more dynamic shots, producing a very unique style. It will be interesting to test this with different moving subjects in the future. Male bold Jumping Spider (Phidippus audax) on the move. Finally, I can now create portraits of small critters while still retaining much of the surrounding background. Bumblebee (Bombus sp.) staring straight into the camera. Thank you for following these posts about my evolving wide-angle macro style. I hope they serve as inspiration for creating your own setup. Here’s to a new year full of photographic adventures! It is intriguing that I do not post much about North American insects. In fact, ever since I moved to Canada I became more and more obsessed with animals found in my home country (Israel). Some might say this is a common case of “you don’t know what you’ve got till it’s gone”, but this does not mean that North American insects are not exciting or interesting. On the contrary, there are many insect species I hope to see in person. One of these insects rewarded us with its presence during a day trip to Hilton Falls Conservation Area in Ontario. I thought I should write about it and share a little bit of the process of photographing it. Giant ichneumon wasps (genus Megarhyssa) are some of the biggest North American wasps thanks to the females’ long (10cm) ovipositor, which is longer than the wasp’s own body. These wasps might look fierce but they are actually shy and harmless insects. They are parasitoids: their larvae develop as parasites living inside the body of other insects. The female’s ovipositor is therefore not a stinger, but an organ used to inject eggs into the larva’s host. Wide-angle photo of a female giant ichneumon wasp (Megarhyssa macrurus) during oviposition. Very quickly I ran across one of the problems I mentioned in this post. The wasp is so thin and delicate and easily gets “lost” in the background, even when it is slightly out-of-focus. To get a better result, I started to cut broad leaves and placed them like tiles in the background. This photo was taken with the same, non-macro lens as above. Surprising result! Megarhyssa wasps attack the larvae of another wasp, Pigeon horntail (Tremex columba), which bore into dead wood. The female can detect tiny vibrations coming from inside the wood by the feeding horntail larvae. She then proceeds to egg-laying: she bends her abdomen, exposing her ovipositor from its flexible sheath, and starts drilling. When she reaches a horntail larva, she sends an egg all the way down the ovipositor and injects it to the host. The parasitoid wasp larva feeds on the host and kills it, and then pupates inside the wood. The new generation of Megarhyssa wasps will emerge as adults in the following summer. Back to the process of photographing – The next thing I wanted was to test the flexibility of the lens (I always recommend doing this), so I took a few more “creative” shots at different angles. What I like about this photo is that you can also see some of the previous holes this female drilled using her ovipositor. The last goal was to get a dreamy background, showing some of the light entering through the canopy. This was a bit tricky, because the wasp was facing down towards the ground. Since I do not have special equipment (such as an angle-viewfinder or a tilt-screen), I had to be creative and improvise. Unknowingly, I had my photo taken while trying to compose the shot. I was completely unaware of my pose because I was too focused on photographing, and I guess some of the poses I tried might have been embarrassing for my trip partners… To tell the truth, I had no idea my body was even capable of getting into these positions. If you look closely, you can even see the wasp in this photo, it is very big! Flexibility is important while photographing insects! Photo by Mio Konfedrat. Nice to cross this incredible species off my “wanted” list. In this final post I will list some of the major problems that arise when photographing wide-angle macro using different lens systems. Some issues were already covered in the previous posts (lens barrel distortion, background focus and sharpness) so they will not be repeated. Difficult lighting situations – this is the number one problem, due to the camera being held very close to the subject. Very often the lens will cast shadows on the subject, especially if it is a wide-angle prime lens with a big front element. There is no real way around this other than experimenting with fill flash or wisely positioned reflectors. I found that a diffused flash on a bracket held tightly close to the lens’ front element does the job, but it can be cumbersome. A ring flash or a similar arrangement (like the one shown here) might do the trick as well. In order to photograph this 9mm-long weevil infected with Cordyceps fungus I had to position the lens very close. I used a long exposure and light-painted some of the shadows with a small LED torch. Canon 7D, Sigma 10mm fisheye, x1.4 teleconverter, 6.3mm custom-made extension tube. 10 sec at f/22, ISO800. Fill twin-flash with DIY diffusers, LED torch. Even after post-processing there is still some chromatic aberration visible along the branch in this photo of an ornate predatory katydid (Saga ornata) from Israel. Canon 7D, Sigma 10mm fisheye, x1.4 teleconverter. 1/50 at f/20, ISO100. Fill twin-flash with DIY diffusers. Dirt on lens – surprisingly this is one of the least mentioned problems but it is so important that it gets a special spot among the top three. We like to use wide-angle lenses because of the increased depth of field, but unfortunately this also means that every speck of dust on the front element will be seen in the final image. And if you like to shoot against the sun like I do, any smear will cause a disgusting lens flare that is hard to remove in post-processing. Therefore it is of utmost importance to keep the front element as clean as possible when photographing. For those of you who like to photograph in flower-splashed fields – pollen is another common nuisance. Dust on lens appears as colorful specks in image when using a relay lens. Canon 7D, Canon 24mm STM + FIT Gyorome-8. 1/160 at f/22, ISO400. Fill twin-flash with DIY diffusers. Manual and relay lens systems – There are many advantages to constructing your own wide-angle macro lens system, but unfortunately the complexity of their use poses some serious challenges. One of the main issues is that these systems do not have electrical contacts, and therefore there is no communication between the camera body and lens, no aperture control, and no auto focus. When using DIY short extension tubes with wide-angle lenses to achieve greater magnification, very often the lens focus must be set to infinity and the only way to actually focus on the subject is to gently rock the camera body back and forth. Another common challenge comes when using relay lens systems (you can see mine appearing in this brief post), especially ones that incorporate CCTV lenses: the image in the viewfinder will often be displayed upside down, and if the aperture is closed it will be extremely dark, making it very difficult to properly compose the image and focus. If “shooting in the dark” manually does not scare you enough, the images produced by these lens systems are often soft despite the increased depth of field. To know why, you must understand how a relay lens works. In a nutshell, the front lens projects a small image that is then enlarged by another lens to fit the coverage of the camera’s sensor. This increase in image size causes an apparent loss of resolution. All these issues are solvable, and honestly once tackled they are not much of a big deal. This is what I actually see in the viewfinder when using a relay lens system, a dark inverted image. After some careful post-processing of the above image of a plume moth (Hellinsia homodactylus), I was able to get this result. Canon 7D, CCTV relay lens system. 1/10 sec at f/16, ISO1250. Fill twin-flash with DIY diffusers. The great advantage of CCTV relay lens systems is the small size of the front lens, which allows to sneak up on unsuspecting insects. Unfortunately, this means that they will not hesitate to climb on, like this giant mantis (Eremoplana infelix) from Israel. Canon 7D, CCTV relay lens system. 1/100 at f/16, ISO640. Fill twin-flash with DIY diffusers. Uncooperative subjects, focusing distance and getting too close – this is not really a problem but more of a skill that evolves with the photographer’s experience. The main issue when using wide-angle lenses of any kind for macrophotography is that you have to get very close to the subject, and with some lens systems you will literally almost touch it with the front element of the lens. This, for obvious reasons, makes most live subjects very uncomfortable, causing them to pose unnaturally, or even to escape. Because of this, it is important to know your subject, so you can approach it without scaring it. It is also important to be able to predict the subject’s behavior. Some caution should be used here; while some subjects will simply take the chance to climb on your lens, others will not hesitate to attack if you get too close. Do not take unnecessary risks. Sometimes getting too close triggers an interesting response from the subject, like in this case of a male Wellington tree weta (Hemideina crassidens) from New Zealand. Canon 7D, Sigma 10mm fisheye, x1.4 teleconverter. 1/30 at f/18, ISO100. Fill twin-flash with DIY diffusers. …and sometimes it is better to know when to back off. When this venomous wandering spider (Phoneutria boliviensis) started walking towards the lens, I quickly stepped back. Canon 7D, Canon 14mm. 1/10 sec at f/18, ISO400. Fill twin-flash with DIY diffusers. This conehead katydid from Belize started walking on the surface of the lens while I was taking the photo. If it wasn’t for the extension tube used here, this photo would have been out of focus. Canon 7D, Sigma 10mm fisheye, x1.4 teleconverter, 6.3mm custom-made extension tube. 1/5 at f/22, ISO1600. Fill twin-flash with DIY diffusers. UPDATE (30 Dec, 2015): There is now a part 4 to this wide-angle macro series! Click here to read about my experiments with relay lens systems. UPDATE (17 Aug, 2017): I added my review of the Laowa 15mm Wide Angle Macro lens in the links. You can also find it here. 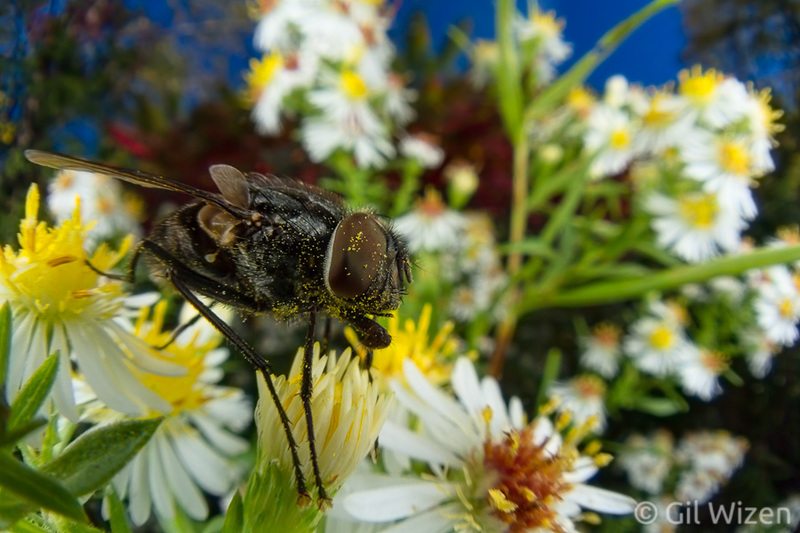 In this post I will discuss common misconceptions about wide-angle macrophotography. These are all things that I heard from people discussing this photography style. Please note that the opinions expressed here are my own only, and are not to be perceived as rules of any sort. Taking it all in – A very popular view of wide-angle macro is that you have to include ALL the habitat in the background. Not just the subject and its perching spot, but also the ground, trees and even rivers, snow-capped mountains, and I dare say the sun or moon! In most cases this is unnecessary. It is true that wide-angle lenses have the capability of including much in the frame, but there are many creative ways to use them. The main element in the photo is the subject; the background is there just to provide a context for it. A wide-angle macro shot can be perfect even without the horizon line or the sky. Schneider’s skink (Eumeces schneideri) from Israel. I wanted to capture the “feel” of the windy meadow it was living in. Canon 7D, Canon 14mm. 1/125 at f/14, ISO100. Fill twin-flash with DIY diffusers. Bigger is better – There seems to be an unofficial race among wide-angle macrophotographers to get the highest magnification from their gear. This is understandable: the bigger a small subject is in the photo, the more impressive the final result. However, this does not necessarily mean that the subject must be photographed at the closest focusing distance. There is a place for photographs showing subjects from afar, how they blend-in in their surroundings, or go about their daily life. I am aware that this may be considered leaving the macro realm and stepping into regular wide-angle photography. In my opinion it is a blurry borderline, and if the subject is small-sized, it is still considered macrophotography. I could have gone much closer while photographing this leaf-mimicking katydid (Cycloptera sp.) in Ecuador, but I wanted to show how it blends in perfectly with the bush it was resting on. Canon 7D, Canon 14mm. 1 sec at f/18, ISO400. Fill twin-flash with DIY diffusers. Super sharpness – Everything, from subject to background, must be in focus and super sharp. While depth of field is certainly important in wide-angle macrophotography, I will argue that in most cases a sharp background can draw the viewer’s attention away from the subject. Our eyes tend to fix on whatever is sharp. Nicky Bay did an excellent experiment demonstrating just that: when he stacked two photos to create a super sharp image of a frog in the rainforest, it became harder to keep the eyes fixed on the amphibian. Unless your intention is to show camouflage, I recommend leaving the background slightly out of focus. And if your subject is a slender insect such as a mantis or a stick insect, consider opening the aperture even more to get a shallower depth of field. This green lynx spider (Peucetia viridans) would have been lost in the busy background if it had been any sharper. Canon 7D, Sigma 10mm fisheye, x1.4 teleconverter, 6.3mm custom-made extension tube. 2.5 sec at f/22, ISO800. Fill twin-flash with DIY diffusers. Barrel distortion is bad – Wide-angle lenses are especially prone to barrel distortion. This changes perspective and proportions of objects in the photo, causing whatever is in the center of the frame to appear larger, and straight lines (for example trees, horizon) to appear curved. Many photographers are in a constant battle against barrel distortion, trying to find the best way to eliminate it in post-processing. I somewhat agree; a curved horizon can really be distracting (unless you go for a fisheye effect). But in times when I do not have a clear horizon in the frame (a dense forest is a good example), I find that the distortion can be “forgiven”. In other cases, I find that it actually draws more attention to the subject, if its body proportions are exaggerated. Sometimes the “fisheye look” can directly translate to a “bug-eye look”, even though it may not truthfully represent what insects see. If humans were the size of an insect, maybe this is how we would see the world. Because wide-angle macro attempts to shrink the viewers and make them a part of the scene, barrel distortion is not necessarily a bad thing. When barrel distortion can be excused: Chicken of the Woods mushroom (Laetiporus sulphureus) is the center of attention in this photo. The curved trees in the background are not distracting. Canon 7D, Canon 14mm. 1/15 at f/16, ISO1600. Fill twin-flash with DIY diffusers. The Monarch butterfly (Danaus plexippus) wings touched the front element of the lens, creating the illusion that they are exaggeratedly extended. Canon 7D, Sigma 10mm fisheye, x1.4 teleconverter. 1/160 at f/11, ISO100. Night wide-angle macro is impossible – This is hardly the case. It depends on what you want to capture. The lack of ambient light does make it hard to include much of the habitat in the photo, therefore you must plan the shot before taking it. A tripod and remote shutter release are a must. While I personally do not have much experience in doing so, night wide-angle macro is definitely possible with light painting and clever composition. Some of my favorite night wide-angle macro shots come from Javier Aznar (who won in competitions several times for his inspiring photography) and Nicky Bay. This freshly molted Heterophrynus batesii was photographed during a rainy night hike in the forest. Canon 7D, Canon 14mm. 1/10 at f/14, ISO800. Fill twin-flash with DIY diffusers. All wide-angle macro photos look the same – of course not, as can be seen just by browsing along this blog post. Every photographer has their own style. In fact, I see much more conformity in landscape photography. If you feel that all your photographs end up looking the same, maybe it is time to try doing something a little different. For example, I had a small wide-angle lens lying around for years, no matter how I used it I could not get the image I wanted from it. Last week I decided to couple it with a new lens and was amazed by the results. Now, some photographers will insist that “you never go full fisheye”, but I disagree. If anything, stepping out of your comfort zone and trying something new is very healthy for your point of view and inspiration as a photographer. Peephole lenses can produce interesting framing, like in the case of this white-faced Meadowhawk (Sympetrum obtrusum) from Ontario, Canada. Canon 7D, Canon 24mm STM + FIT Gyorome-8. 1/160 at f/20, ISO400. Fill twin-flash with DIY diffusers. When the subject (leafcutter bee, Megachile sp.) stares directly into the camera the result is even more spectacular. Canon 7D, Canon 24mm STM + FIT Gyorome-8. 1/160 at f/22, ISO400. Fill twin-flash with DIY diffusers. Photo must be “perfect” – Wouldn’t we all like everything to be the way we envisioned it? Unfortunately, in photography things do not always go as planned. In wide-angle macro it is all too common, there is just too much that can go wrong. Keep photographing. Among those so-called crappy photos one might actually stand out as unique. In fact, very often not-so-perfect photos are much more interesting than “Photoshop-perfect” ones. No one wrote any rules for wide-angle macrophotography, and if there are rules, they can be bent from time to time. The only limitation is your own creativity. Including the human element in the photo can help in telling a compelling story. In this case, we searched for ornate predatory katydids (Saga ornata) for hours, and in the end they turned out to be right under our nose. Canon 7D, Sigma 10mm fisheye, x1.4 teleconverter. 1/40 at f/20, ISO100. So what happens when things do go wrong? In the next post I will go over some of the major problems that arise when photographing wide-angle macro and using different lens systems. Along with the predatory Saga katydids, Acrometopa syriaca is one of my favorite katydid species in Israel. There is something unique about its appearance; it almost looks like a tropical katydid that does not belong in the Mediterranean region. This species does not have a common name, so I suggest – “Mediterranean leaf katydid”. In my opinion, there is no other katydid in this area more deserving to be called a leaf-mimic. When I visited Israel in early spring this year, I could only find tiny katydid babies. They were very easy to recognize as Acrometopa by the pale, extremely-long-yet-thick antennae, which are rich in sensory hairs. Apart from Acrometopa, only Saga species have thick antennae, whereas all other katydid species in Israel have relatively thin antennae. Baby Mediterranean leaf katydid (Acrometopa syriaca) on a blade of grass, Upper Galilee, Israel. Note the thick hairy antennae, used to detect approaching predators and enthusiastic macrophotographers. There is very little chance to mistake adults of Acrometopa syriaca with another katydid species. It is big (can easily reach 12cm leg span, even longer if antennae are included), slow, and rarely jump. Apart from its characteristic antennae, it is always green, and has wide forewings that have both the color and texture of a leaf. This excellent camouflage makes it very difficult to find the katydid when it rests on bushes or small trees. Females are rounder in their appearance, while the males have longer hind wings that extend beyond the forewings. In addition, this species’ huge hind legs are unmistakable. I just happened to be lucky enough to visit Israel again in early summer, and I was hoping I could find some adults. Even though this species has a relatively wide distribution throughout the country, I drove to the Golan Heights in the north, because I have always been under the impression that they are easier to locate there. But I found nothing. I returned frustrated to the Central Coastal Plain, only to find an adult female very close to the place I was staying at. Obviously, I could not resist the temptation to photograph her for Meet Your Neighbours biodiversity project. But it was not over just yet, for this katydid was also a fine candidate to test something I wanted to do for a very long time: photography of fluorescence under UV. I have photographed UV fluorescence of arthropods in the past; scorpions are usually the default subjects for this style of photography, because they show intense fluorescence even under long wavelengths in the UV range (380nm-395nm). This makes photographing “glowing” scorpions very easy with cheap UV torches (you can see examples of such photos in my scorpions gallery). Things get more interesting under a shorter wavelength, specifically 365nm and shorter. I will not go into details here because I plan to write a bigger post about UV photography, but I will just say that many unexpected things start to fluorescence when exposed to this light, including representatives of several insect groups. I suspected that Acrometopa syriaca would “glow” because other members of the same subfamily, Phaneropterinae, were also found to show fluorescence under 365nm UV light. And as expected, it did not disappoint: when I shone my torch the whole katydid became bright turquoise in color – just stunning! 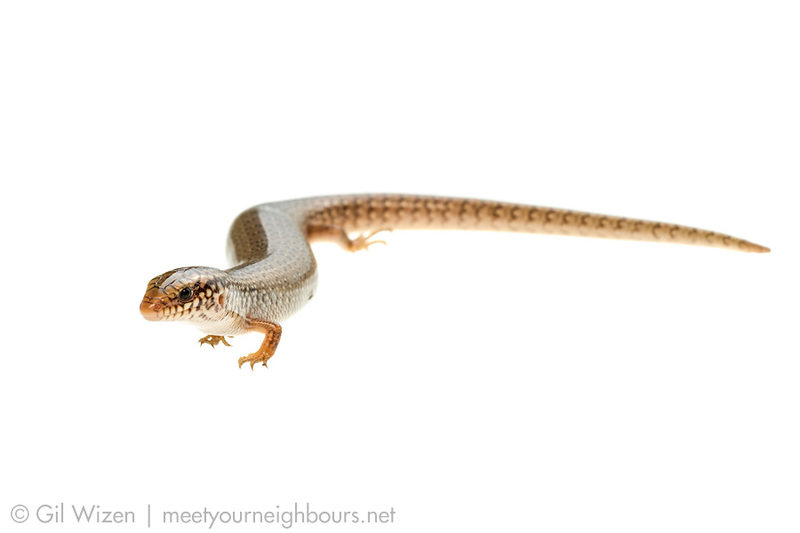 I recently joined as a contributor to Meet Your Neighbours – a global photography project that sets out to connect communities with their local flora and fauna, and promotes nature conservation. The idea is to record all possible biodiversity against a clean white background using a simple field studio. By stripping the subjects off their natural surroundings they become the center of attention, provoking more interest. Another benefit from photographing against a white background using a standard protocol is that all subjects from different parts of the globe get the same level of appreciation, regardless of their location or taxonomic group. This can reveal interesting patterns: when comparing subjects from different origins it is difficult to say which is more exotic. In other cases, subjects that are physically very distant from each other share many similarities in appearance. I discovered Meet Your Neighbours in 2010 and was immediately hooked. I liked this style of photography, which reminded me of old natural history books featuring illustrations of plants and arthropods. At that time I was already trying to achieve similar results in my photography, only I was using white paper as background so the effect was a bit different. For this reason I was delighted and honored when Clay Bolt, one of MYN founders, contacted me in 2013 with the offer to join the project. For me this meant one main goal – presenting species from Israel, even though I am based in Canada and travel quite extensively to other countries. Darkling beetle (Erodius gibbus). This is perhaps the most easily recognized beetle in Israel (after the overrated ladybug). Its small size, oval shape, and matte back color are unmistakable. This species also has a wide distribution range in sand dunes along the Israeli coast, and it can be found in the desert as well. Israel is located at the bridge of three continents – Europe, Asia and Africa. Due to its geological history and a variety of ecological conditions, Israel is characterized by a climate gradient from north to south, and to some extent from west to east. This creates many habitat types throughout the country, which are home to an impressive diversity of animals and plants. Most species in Israel are typical to the Mediterranean region, but desert species can be found in south of the country, whereas species from colder origins like Europe and Asia are found in northern Israel. For the latter Israel is the southernmost point in their distribution. Some species of tropical origin can also be found in the oases along the Great Rift Valley. I decided to start my contribution to MYN from the very base, the creatures I know well from the places I explored as a kid. The semi-stabilized sand dunes of Israel are home to the beautiful ground beetle Graphipterus. A recent study revealed that instead of the single species G. serrator, there are actually three similarly-looking Graphipterus species in Israel, each with its own distribution. This beetle, from the Central Coastal Plain, seems to be a new species to science and is currently being described. I grew up in a city in the Central Coastal Plain of Israel. I had the fortune of spending my childhood with a lot of nature around me. Wildflower fields, Citrus orchards, temporary ponds and sand dunes were at walking distance from my house. Every weekend I would go out in the morning and get lost somewhere in the wilderness, looking for interesting animals. And there was much to be discovered: tame snakes, skinks, beautiful insects like beetles and mantises, frogs and spiders. I used to rear butterflies in my room because I was fascinated with the transformation from a caterpillar to the adult butterfly. I am still fascinated by this metamorphosis even today, although I focus on other insect groups. This spring, I took a short research trip to Israel, and used this opportunity to document some of my favorite animals. I hope that through these photographs people can learn more about the diversity of the country and maybe in time will even consider visiting! Compsobuthus schmiedeknechti, one of the smallest scorpion species in Israel. This adult female is only 3cm long, including the tail! I was very fortunate to meet one of the most charming reptiles in Israel: the Mediterranean Chameleon (Chamaeleo chamaeleon rectricrista). Every encounter with a chameleon is always a splash of spectacular coloration and behavior. This individual was very cooperative and returned to its perch after the photo shoot.